What does it take to turn around a declining neighborhood restaurant scene in a tony corner of Upper Northwest D.C.? Indian street food, apparently, and we're all the more lucky for it. Cleveland Park, one of the coziest northwest red-line neighborhoods, used to be a prime dining destination in the city. When I moved to the neighborhood in 2001, I was excited to live in an area known for its diverse dining options. This was well over a decade before places like 14th Street and Shaw became filled with a seemingly endless array of eating options. Recent years haven't been kind to the Cleveland Park dining scene, which has been marked by a number of closures--Palena, Dino and Ireland's 4Ps most notably--without notable, or in many cases any, replacements. There are still good reasons to eat in Cleveland Park, such as Fat Pete's barbecue, Italian Coppi's and Top-Chef alum Marjorie Meek-Bradley's Ripple, but the long-vacant restaurant spaces really stick out, as the aforementioned three vacant spaces are among the most prominent locations in the neighborhood. The reasons for the vacancies are not entirely clear. Some say it's because new restaurants are more interested in hot zones like Shaw, U Street and the SW Waterfront. Some say it's because of the area's high rent. Others blame local zoning rules that cap the percentage of Cleveland Park commercial space that can be used for restaurants at 25 percent. Although I've read this was done to help ensure the neighborhood maintains a variety of commercial uses (and not just eating and drinking), it seems that non-restaurant businesses are not interested in these spaces. After all, what type of business besides a restaurant would be interested in a space configured for a large seating area and an industrial kitchen? If the aforementioned zoning rules are the reason behind Cleveland Park's restaurant gaps, you may be wondering how Bindaas managed to pull of its opening? Well, it's technically more of a repurposing than a wholly new space, as it occupies the former Bardeo half of Ardeo+Bardeo, and is mostly but not completely closed off from Ardeo, which now returns to its former half-size (and both Ardeo and Bindaas have the same owners). All this to say that the fact that the area's newest restaurant has foodie tongues wagging--in a major way unseen for years in the neighborhood--is a major coup for Cleveland Park. And deservedly so, for Bindaas is a thoroughly enjoyable and unique dining experience. Sure, there's no shortage of good Indian restaurants in D.C., as I wrote about last year. This includes Indique, which is just a block away and recently refreshed its menu. It also includes Rasika, the downtown restaurant generally regarded as the best Indian restaurant in the city (and among the best restaurants period). That bodes well for Bindaas, since its kitchen is helmed by James-Beard-award-winning Rasika chef Vikram Sundaram. While the name may be familiar, the cooking might not be, as Bindaas' menu is inspired by Indian street food, making it an exciting departure from the usual tandoori, curry and tikka masala dishes available at most American-Indian restaurants. 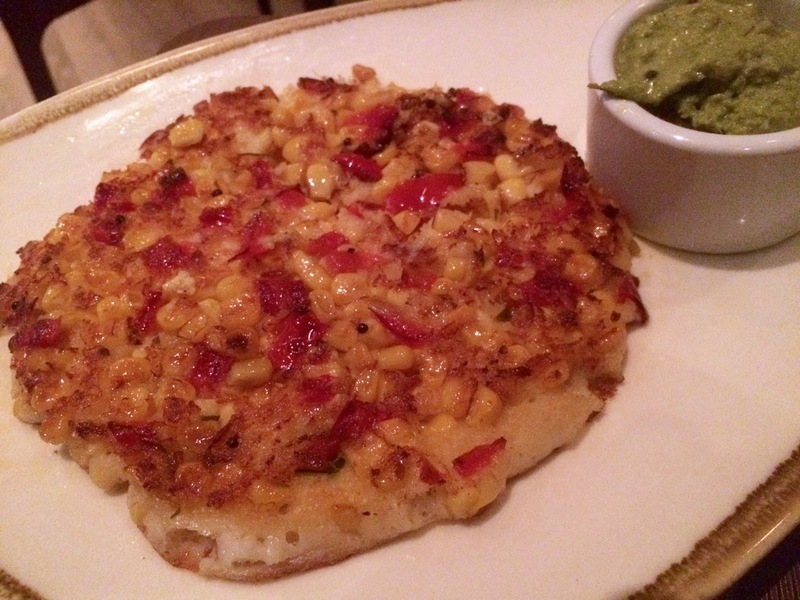 As is common in newer restaurants, our server informed us that all the dishes on the menu are meant to be shared. The night we went, we had another couple in tow, giving us the opportunity to sample than we would have normally. And almost everything was a home run. "Oh my god, this is so good" because the mantra of the night. The menu opens with a selection of chaat, small plates of just a few bites. Nothing we tried from this section of the menu was disappointing. 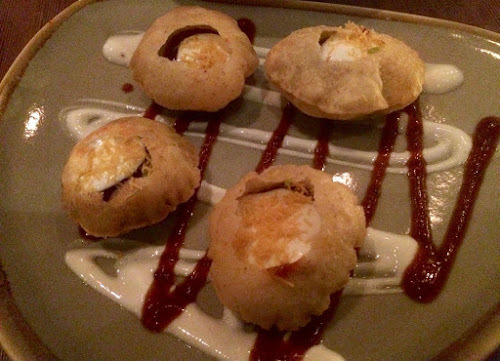 One-bite golgappa, crispy fried biscuits, arrive filled with avocado and set atop overlapping streaks of yogurt and spicy-sweet tamarind chutney. Crunchy fried shisito pepper pakodas, which I've read can be hot, but ours weren't. The accompanying pickled onion chutney adds a tangy note. 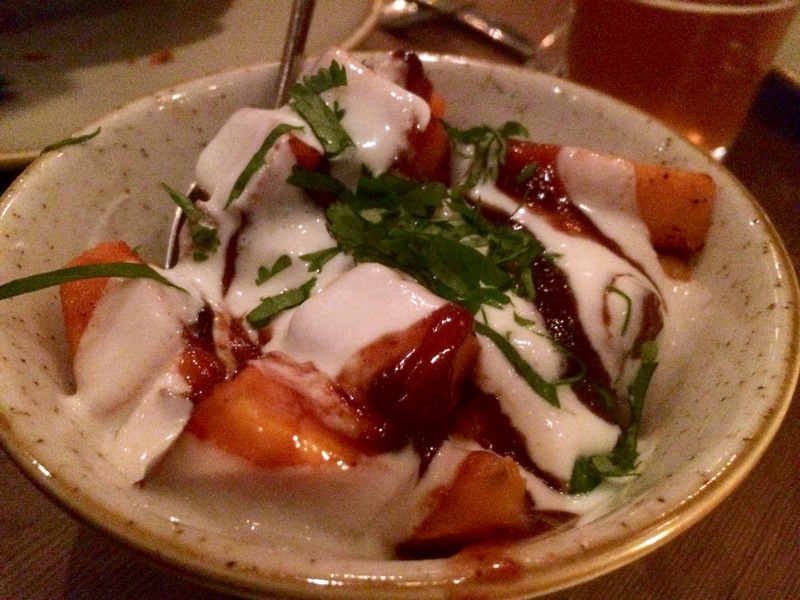 Although the fried goodies are tasty, the chaat selections also include more healthful offerings like sweet potatoes roasted with cumin and chili and enrobed in sweet chutney and yogurt (pictured at top). Our favorite from this section of the menu: bhel puri, a wonderfully fresh grain salad of puffed rice, mango and mint. Having chosen so many chaat dishes, we selected fewer tastes from the rest of the menu, which consists of slightly larger dishes. The pao bhaji was another winner, a spicy vegetable stew served with grilled buns perfect for dipping. Although I've heard the naan at Bindaas is stellar, we opted instead for uttapam, a rice pancake that Bindaas serves with several topping options--we chose corn and red peppers, another winning combination. The only dish out of the bunch that fell short was the chicken kebab, which came with a delicious makhani sauce but the chicken itself was surprisingly tough and rubbery. 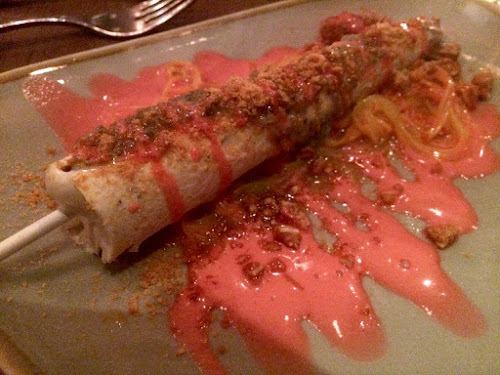 For dessert, we opt for kulfi--so good we're told by our server that we decide to order two of them. And we made the right choice. The treat is a cone of ice cream on a stick served over noodles with crunchy almond nougat and other sweet sauces and spices. A nice surprise awaited us at the end of the meal: the bill. It was surprisingly small. Granted, we ate a bit on the light side, but not so light that we weren't satisfied. Our party of four spent as much as a party of two can easily spend around D.C. these days. Who knows whether the holes left by Palena, Dino and the 4Ps will be filled anytime soon. I sure hope they are. In the meantime, Bindaas's excellent cooking and fine service is more than enough to distract from that issue, providing an excellent reason for choosy diners to discover (or re-discover) Cleveland Park. Bindaas, 3309 Connecticut Avenue NW, Washington, DC (Cleveland Park, near Macomb Street). (202) 244-6550. Reservations: Resy.